March 9, 2016 – Air Transport Services Group, Inc. announced today agreements with Amazon Fulfillment Services, Inc., an affiliate of Amazon.com, Inc., to operate an air cargo network to serve Amazon customers in the United States. 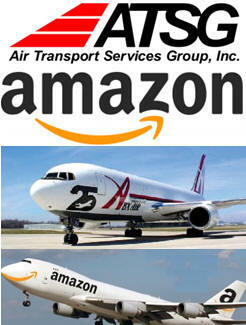 The commercial agreements will include the leasing of 20 Boeing 767 freighter aircraft to Amazon Fulfillment Services, Inc. by ATSG’s Cargo Aircraft Management (CAM), the operation of the aircraft by ATSG’s airlines, ABX Air and Air Transport International, and gateway and logistics services provided by ATSG’s LGSTX Services. The duration of the 20 leases will be five to seven years; the agreement covering operation of the aircraft will be for five years. “We offer Earth’s largest selection, great prices and ultra-fast delivery promises to a growing group of Prime members and we’re excited to supplement our existing delivery network with a great new provider, ATSG, by adding 20 planes to ensure air cargo capacity to support one and two-day delivery for customers,” said Dave Clark, Amazon senior vice president of worldwide operations and customer service. In conjunction with the commercial agreements, ATSG also has agreed to grant Amazon warrants to acquire over a five-year period up to 19.9 percent of ATSG’s common shares at $9.73 per share, based on the closing price of ATSG common shares on February 9, 2016. ATSG is a leading provider of aircraft leasing and air cargo transportation and related services to domestic and foreign air carriers and other companies that outsource their air cargo lift requirements. ATSG, through its leasing and airline subsidiaries, is the world's largest owner and operator of converted Boeing 767 freighter aircraft. Through its principal subsidiaries, including two airlines with separate and distinct U.S. FAA Part 121 Air Carrier certificates, ATSG provides aircraft leasing, air cargo lift, aircraft maintenance services and airport ground services. ATSG's subsidiaries include ABX Air, Inc.; Airborne Global Solutions, Inc.; Air Transport International, Inc.; Cargo Aircraft Management, Inc.; Airborne Maintenance and Engineering Services, Inc., and LGSTX Services, Inc.